Years ago, I was teaching a class in someone else’s shop. We were spraying a table with lacquer on a humid day and the lacquer was blushing. So I reached for a can of lacquer retarder and added about the same amount I typically did in my shop. Hours later, the lacquer was still not dry. In fact, it was quite sticky. What had happened? The shop was warm. We had used the same lacquer the previous day without any problems. Could the retarder have been different? I read the label and saw that it was straight butyl cellosolve, the slowest lacquer solvent commonly available to us, not the blend of a half-a-dozen solvents I was used to. That had to be the cause. So we washed off the lacquer and started over, adding very little of the retarder. The lacquer dried normally. Since that time lacquer retarders containing only environmentally friendly butyl cellosolve have become much more widespread (they used to be common only on the Gulf Coast). Now they are often the only retarder sold in areas with strict VOC laws and they are even common in my home state of Oklahoma, which is one of the dryer areas of the country. So you might well have experienced this slow-drying problem when you switched brands without paying much attention to the label. Adding a slow-evaporating thinner to your finish is one of the main causes of finishes drying too slowly. You have to be aware of what you are getting every time you change thinners. But slow solvents aren’t the only cause of slow drying. In fact, they aren’t even the main cause. The main cause is cold temperature, which causes all finishes to dry slower. Other causes include using a shellac that is too old, applying finish to a very oily wood and not wiping off excess oil finish well enough. Finishing in a cold shop is the most common cause of finishes drying slower. It doesn’t even have to be that cold to make a noticeable difference. Slow drying can result in increased dust nibs and the tendency of “printing” when items are stacked. That is, the items leave pressmarks on each other or stick to each other. The obvious solution is to warm up the shop. But doing this is sometimes difficult, so here are two other solutions that might work for you. If the finish is a lacquer type that thins normally with lacquer thinner, you can add a little acetone to the finish. 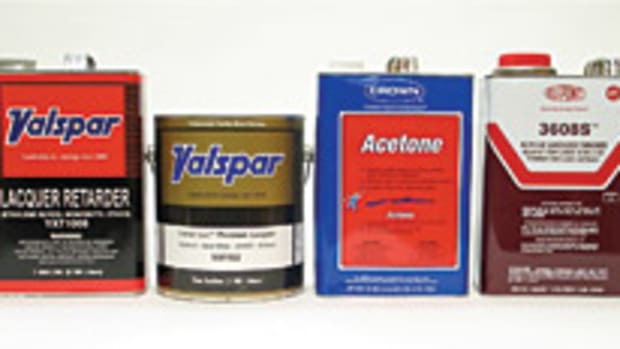 Acetone is the fastest-evaporating solvent commonly available to us and is now widely available because it has been “delisted” as a VOC. Just as with adding retarder, you’ll need to experiment a little to get the right amount in different temperature conditions. Instead of adding acetone, you could switch to a finish that has been formulated with acetone. Because this solvent isn’t considered a VOC, it’s being used in large percentages in lacquers to make them compliant. If you live in an area with strict VOC laws, the lacquer you buy is probably already one of these types. Otherwise, check with your supplier. Cold temperatures also cause catalyzed finishes to not dry properly. The temperature should be kept above 65 degrees for at least six hours after application — and sometimes longer. This usually means keeping the shop warm overnight. 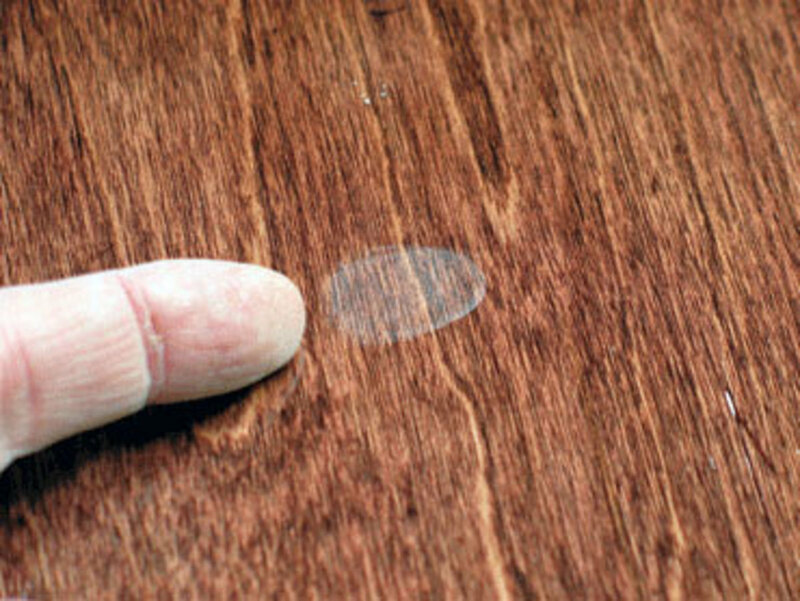 Shellac deteriorates much more rapidly than other finishes. The deterioration leads to slower drying and reduced water resistance and it occurs faster if the shellac is stored in hot temperatures. It’s best to use the shellac within a year of the flakes having been dissolved in alcohol. 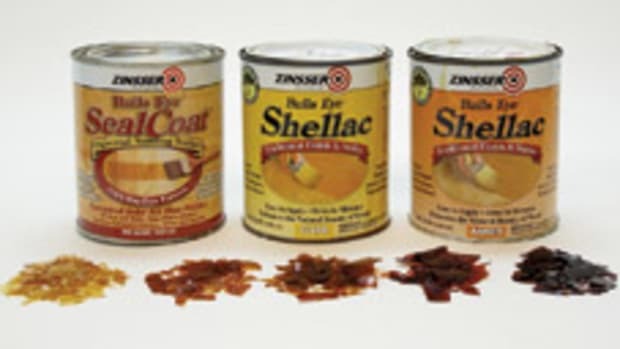 Unfortunately, the lone remaining supplier of already-dissolved shellac, Zinsser Bulls Eye, stopped dating their cans. Now they just stamp them with a lot number. This is a unwelcome change. I guess you could call the company and try to find out when that lot number was made. Otherwise, you’re just going to have to try the shellac to check that it dries normally, because you don’t know how long the can might have sat on a supplier’s shelf. Other finishes also deteriorate, but the deterioration doesn’t lead to significantly slower drying. Precatalyzed lacquer loses some of its durability after a few years (the time varies with different manufacturers) and water-based finishes sometimes curdle after a number of years. I’ve never seen varnish or lacquer deteriorate as long as lids are kept tight, no matter how old it is. Shops are using more and more exotic woods as customers look for something different. These woods often contain resins that feel and act like oil and retard the drying of all oil and varnish products, including oil stains. This is counterintuitive, so much so that it’s common to see instructions in woodworking magazines calling specifically for the use of oil or varnish on oily woods because these are “compatible.” The opposite is the case. Oils and varnishes are the only finishes that don’t dry well. The explanation is this: The non-drying oily resins on the wood’s surface mix into the wet oil or varnish finish and keep the finish molecules apart so they don’t bump into each other and crosslink. The resins act like a paint thinner that doesn’t evaporate. Once you have applied an oil or varnish to an oily wood and discovered the finish isn’t drying, there are only two good fixes: apply heat to the surface to excite the molecules so they are more likely to bump into each other and crosslink or strip the finish and start over. It’s usually easy to strip (actually just wash off) an oil or varnish that hasn’t dried using naphtha, acetone or lacquer thinner. Otherwise use a paint stripper. To prevent a drying problem before it happens, remove the oil from the surface of the wood by wiping with a fast solvent, such as naphtha, acetone or lacquer thinner, and apply the finish soon after the solvent evaporates. Or seal the wood with shellac, which bonds well to oily woods. What is meant is all of the excess. The surface should not be left damp to the touch. Oil doesn’t dry well, so leaving even the slightest dampness will result in a sticky surface for a long time. If you have a situation where you didn’t remove enough of the oil and it’s now too sticky to remove with a dry cloth, follow the instructions above for dealing with an oil or varnish that won’t dry on an oily wood.